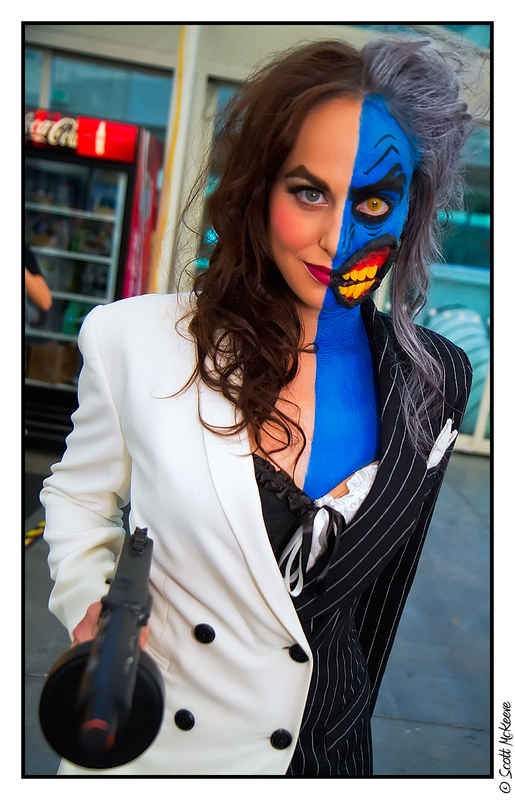 Don’t Be Tricked By This Two-Face Costume « Adafruit Industries – Makers, hackers, artists, designers and engineers! Hydred began by painting my left side (face, neck, and even bust) with blue latex. For delicate areas around the eyes we instead used a saturated blue eye shadow. From there, Hydred built up the mouth with wax, using Spirit Gum to adhere it to my face. We filed and painted acrylic nails yellow to use as the teeth, which were carefully placed and secured within the wax structure. 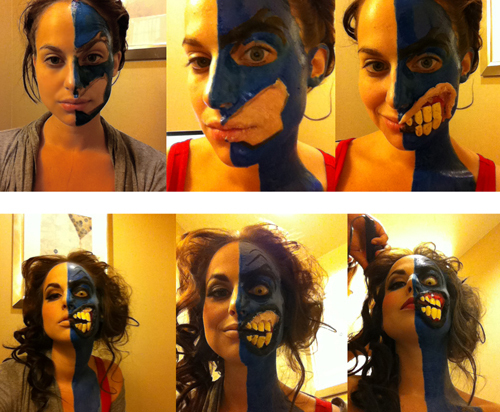 Next, gums were layered on and attached above the teeth, before being painted various shades of black, red, and blue. We decided to exaggerate my features with animation-esq lines, drawn on with black eyeliner and shaded by a careful hand. Even my eyebrow on the right side was made to be a bit more angular, hinting at the inborn deviance of Two-Face. For hair we opted for flowing curls on one side, contrasted by a wild, white up-do on the other.